Fender Jazzmaster is a very versatile kind of an electric guitar. Four pots and two switches are giving a lot of tone configurations. It's also something interesting for me, as someone who like to get his own way of signal control. 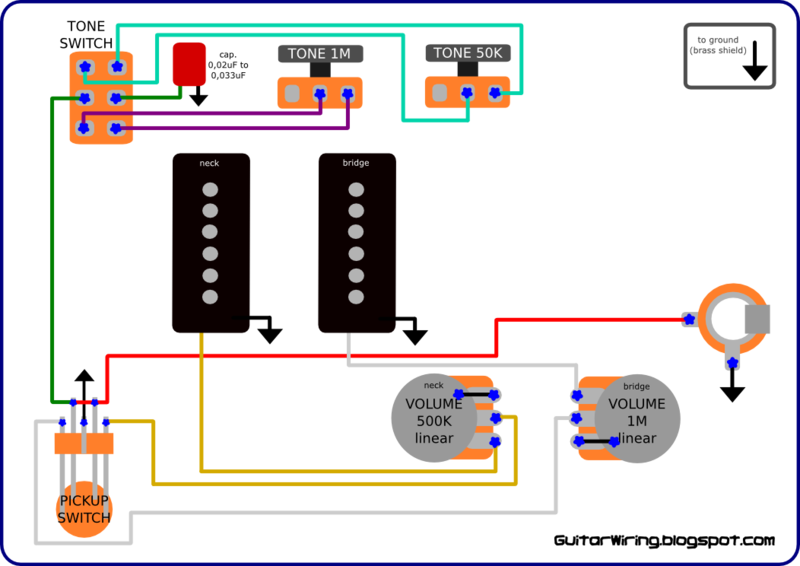 I made a customized diagram of the Jazzmaster wiring. The basic difference is in the way of controlling brightness and darkness of the guitar tone. My wiring has got many options for both pickups. The original Jazzmaster circuit is offering more for the neck, than for the bridge position. There is only one extra part. It's the 500K linear volume pot. I putted it in the place where standard wiring has got the 1M pot. The rest of modifications are based on wires and the tone capacitor connections. You can make them from the original parts. Every pickup has got its own, separate volume control. Both pickups have connection to the tone control circuit. The tone control can work in two ways - with the 1M pot or with the 50K pot - the brighter and the darker way. The neck pickup has got its own 500K volume potentiometer. The yellow wire connecting the pot with the pickup switch (pickup selector). The 500K pot is a good thing for a gradual signal muffling - if you like this "warming affect" of using the vol. ctrl. The bridge pickup has got the 1M volume pot. It will give a brighter tone then the 500K of the neck pickup. The white wire (on the diagram it's grey) is connecting the pot to the pickup switch. The tone control circuit is made from two pots (these above the pickups), the tone switch and the capacitor. As you can see, the green wire goes right from the pickup switch to the tone switch. By using this tone controller, you can choose which one of two pots (1M or 50K) will be working with the tone cap as a signal filter . The 50K pot will give a much darker sound than the 1M. Potentiometers are not connected to the ground by wires, because their metal covers are touching the brass (which is grounded). All tone options of this Fender Jazzmaster guitar wiring are combined with the 3-way pickup switch. The wiring can give you a lot of new, cool tones. If you thinking about modifying your Jazzmaster, this diagram can be helpful.